Cracks in your walls or floors? Are your windows refusing to budge? Having trouble opening the door when you arrive home from work? If you’re experiencing problems like these, chances are, you’ve got foundation problems. 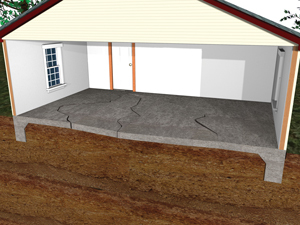 Troubles with your foundation can be costly, up to thousands of dollars in repairs! Whether you’ve owned your house for years, just moved in, or are still looking for that perfect dream home, foundation problems are something that you need to be looking for! I’m not saying you should go and scrounge your house for every little hairline crack or stubborn window, but if you’re not looking for signs like these, the dollars could keep pile up quick! Not sure of what to look for? Here are some of the most common and tell-tale signs of foundation failure. Let’s take a look at the inside of your house. Ladies, the kids are away at school, you’ve scored a day off work, and as you decide to clean up a bit, you notice that there’s a crack in your wall. As you step back, you notice that there’s more than one! Yikes! Cracks in walls and ceilings, even concrete floors, are some good signs that you’re having some trouble! Also be on the lookout for sticking doors or windows, uneven floors, or misaligned entryways. Not every stubborn window is a culprit of ground trouble, but if you’re noticing more than one of these problems, you should probably have a professional company, like Atlas Piers of Atlanta, look at your house to clarify or clear you of your concerns. If you live in or around that Atlanta area, Atlas Piers of Atlanta will put you first, and make sure your home is more than safe! So we’ve covered the interior of your lovely home, but what about the exterior? Men, get your sharp eyes out and ready to go! Whether you’re tossing the ball, doing chores, hitting it up with friends, or having a grill-out, here are some of the signs of foundation trouble that you could be looking for! Firstly, pay good attention to the foundation of your house. If you see loose soil, cracks, or puddles of water in or around your foundation, be alert. These are dangerous signs that your foundation is failing, and that can mean an unsafe house! But don’t forget to look a little closer. If you’ve tried waterproofing, and it doesn’t work, even after you’ve tried and tried and tried, consider this as a cause of your problem. If you have chimneys, pay close attention to if they’re leaning or lopsided. No one wants a lopsided house, and you certainly don’t want thousands of dollars in bills! If you see any of these signs, call a professional sooner than later, and you could fix the problem before it begins to wreak havoc on your home! So, ladies and gentlemen, if you’re seeing any or all of these signs of foundation failure, and live in or around the Atlanta area, make sure to call Atlas Piers of Atlanta. They’ll fix your foundation and the problems that come with it, and make sure that your home and family are safe!